I have a very busy few weeks ahead. First up is my short play ‘Don’t Ask, Don’t Tell’ about US army whistle-blower Chelsea (formerly Bradley) Manning which is to be performed at the Barons Court Theatre from the 17th to 22nd September as part of Kibo Production’s ‘Love, Hate and Human Rights’ festival. 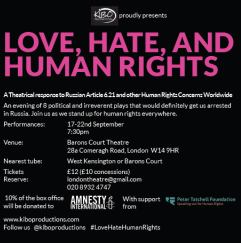 It is one of 8 plays, all tackling human rights concerns. Tickets are £12 (£10 concessions) and can be reserved via email at londontheatre@gmail.com or by calling 0208 932 4747. 10% of the box office will be donated to Amnesty International. 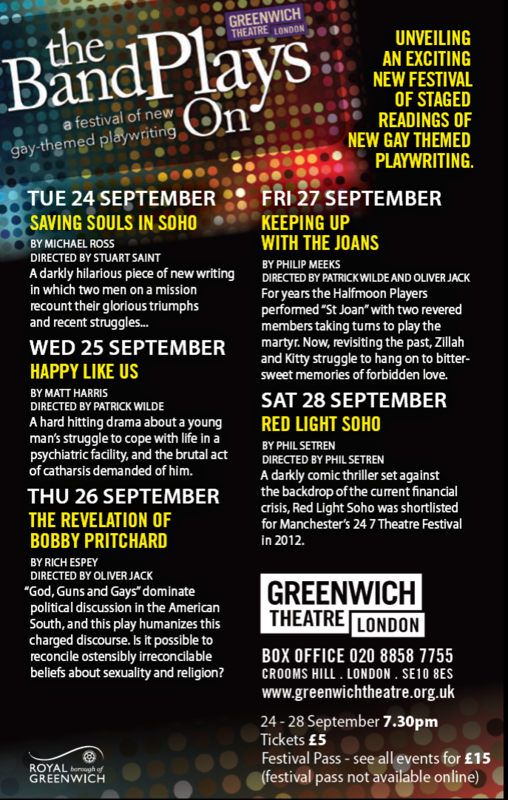 Then, the following week, my full length play ‘Saving Souls In Soho’ opens ‘The Band Plays On‘ festival of gay-themed plays at Greenwich Theatre on Tuesday the 24th of September at 7.30pm. 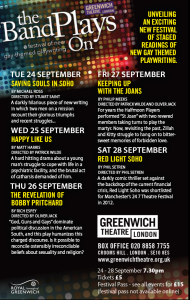 The first festival of its kind in London, it is being presented by Greenwich Theatre in partnership with award winning writer and director Patrick Wilde (What’s Wrong With Angry?) ‘Saving Souls In Soho’ continues the story of my ‘Dawn Rescue’ short film and accompanying website, and is a darkly comic look at how religion corrupts the innocent. Tickets are £5, available from the Greenwich Theatre website here. 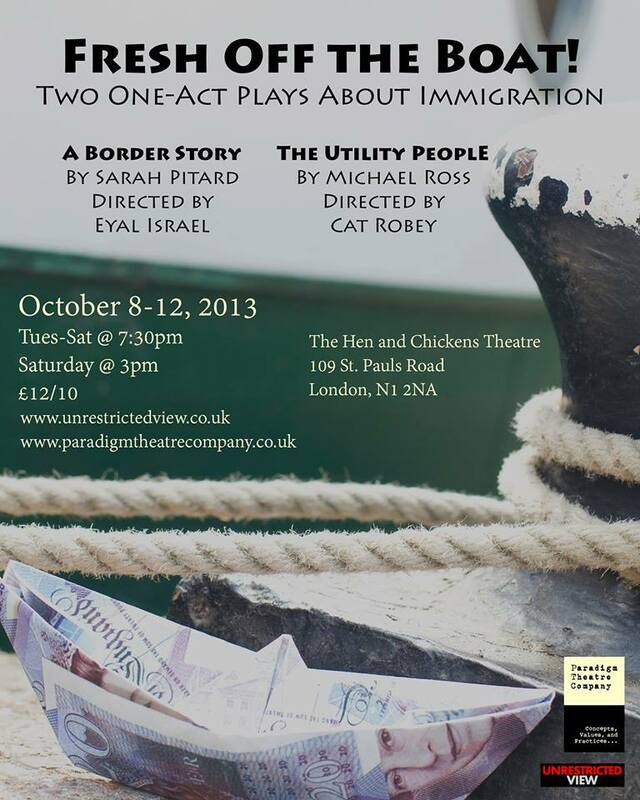 Lastly, I’ve also written a play for Paradigm Theatre’s ‘Fresh Off The Boat,‘ a double bill of plays about immigration to be performed at the Hen and Chickens Theatre from the 8th to the 12th of October. My play ‘The Utility People’ is about a middle-class liberal couple who discover immigrants living inside their utility cupboard, but decide to let them stay in return for doing the cleaning, cooking, and so much more. 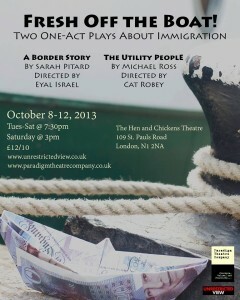 Directed by Cat Robey, it is paired with Sarah Pitard’s ‘A Border Story’ an autobiographical retelling of her own visa nightmare. Tickets available here. Next PostNext Work Makes You Free, the Park Theatre, Jan 2014.